Fall has always been my favorite season: the smell of bonfires, the juicy, gooey caramel apples, the beautiful array of warm tones as you take a drive, pumpkin flavored everything, and the adventure that is October 31st. Something most all of us can relate to, no matter our taste for pumpkin pie, is carving pumpkins with friends and family. Some of us simply created shapes, while others, like myself, attempted crafting a witch on a broomstick in the night sky, which looked more like a blob than an artistic creation. No matter your carving skills, jack o’lanterns have always been a family favorite across the country, but where exactly did this tradition come from? According to historian Jack Santino, fall traditions are rooted in the ancient Celtic Day of Samhain, dating to around the 5th century. It was customary for the Celtics to lay out gifts of food for the wandering spirits who are headed to their next life. Later, this tradition would become a practice of imitating the spirits in masks. Hollow Eve, as it was referred to, marked the end of the fall season. Today, what never left but evolved, are the fruits and vegetables we leave on our porches. 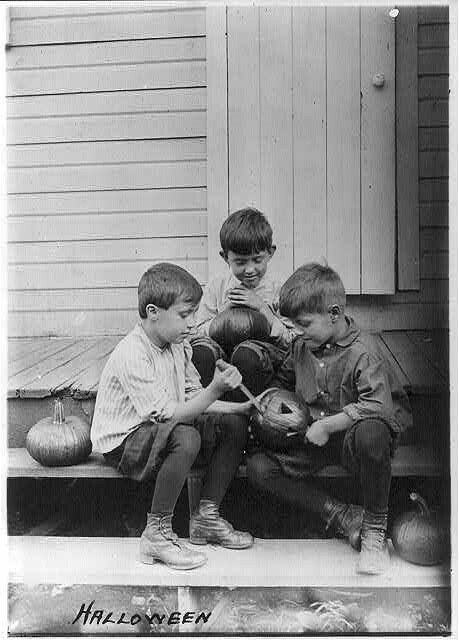 Carving pumpkins, or jack o’lanterns, is a lesser known phenomenon that is embedded in folk lore. The jack o’lanterns are named for a legendary blacksmith named (you guessed it) Jack. Jack was too evil to be allowed into heaven, but had outwitted the devil and could not go to hell either. Instead, Jack wanders the earth with a lantern he built from coal and vegetable. To frighten Jack, Europeans began carving their own lanterns by creating creepy faces into vegetables and placing them near doors and windows. This tradition, like many, traveled with the pilgrims to America where the native fruit, pumpkin, created the perfect jack o’lantern. Today pumpkin patches are near and dear to the fall tradition. There are many excellent ones to choose from in the area. Schaake’s Pumpkin Patch is located in Lawrence, KS and features hay rides, apple cider doughnuts, and a large variety of pumpkins. Another excellent patch is the Powell Pumpkin Patch located in Louisburg, KS. This patch features an intricate corn maze, nature trail, playground and pumpkins. If you’re in Missouri, you can check out Carolyn’s Country Cousins Pumpkin Patch in Liberty, MO. And remember, pick the biggest one! This entry was posted on October 7, 2015 by freedomsfrontier in Uncategorized.